Kentucky’s Rhyne Howard was unanimously tabbed National Freshman of the Year by the USWBA today. 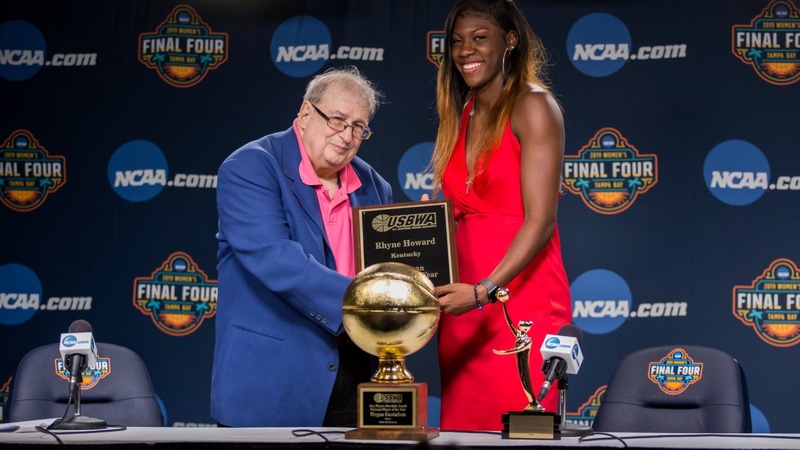 She was presented with her award today in Amalie Arena prior to the Women’s Final Four. Howard was also named ESPNW National Freshman of the Year back in March and WBCA National Freshman of the Year earlier this week. Howard is the first player in Kentucky program history to win a national freshman of the year honor and the 6th SEC player to earn the honor from the USWBA. This award added to her list of honors as the SEC Freshman of the Year, SEC Newcomer of the Year, WCBA All-SEC, and SEC All-Freshman team and second team All SEC. Rhyne Howard was also named SEC Freshman of the Week eight times, she set the program and league records for most rookie of the week awards. Howard is the first UK freshman under Matthew Mitchell to score 10 points in her first 10 games. She put herself in the elite company this season as she is only second freshman in program history to lead the Wildcats in scoring and rebounding, joining UK All-American Valerie Still.